The Swingin’ ME Dining Hall is where all meals are served to guests. The café is located next to the Bunkhouse. Three western-style meals are served each day and are included in the price of your stay. Food is served buffet style. Guests may go back for seconds once all guests have gotten their meal. The meal times are regularly the same for all guests but may be pre-scheduled for your group. Groups will receive their Rotation Schedule concerning meals and activities 30 days prior to their arrival or after final payment, whichever is later. If you have special dietary needs please be sure to have your group’s host fill out our “Dietary Form” at least two weeks prior to your stay. Breakfast – 8:00 - 9:00 a.m. 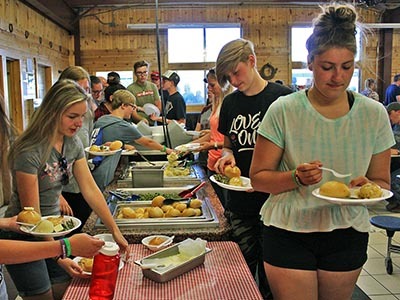 Lunch – 12:00 - 1:00 p.m.
Dinner – 6:00 - 7:00 p.m.
* The above is only a sample of the types of meals served at Reid Ranch. The actual meals served during your stay will vary.